Pittsburgh Steelers quarterback Ben Roethlisberger is a bit unconventional. Not only is the 2-time Super Bowl Champion one of the largest men to ever play the position, he apparently does not care much about holding on to game-used pieces from record-setting performances. He'd rather give back and raise money for a great cause. 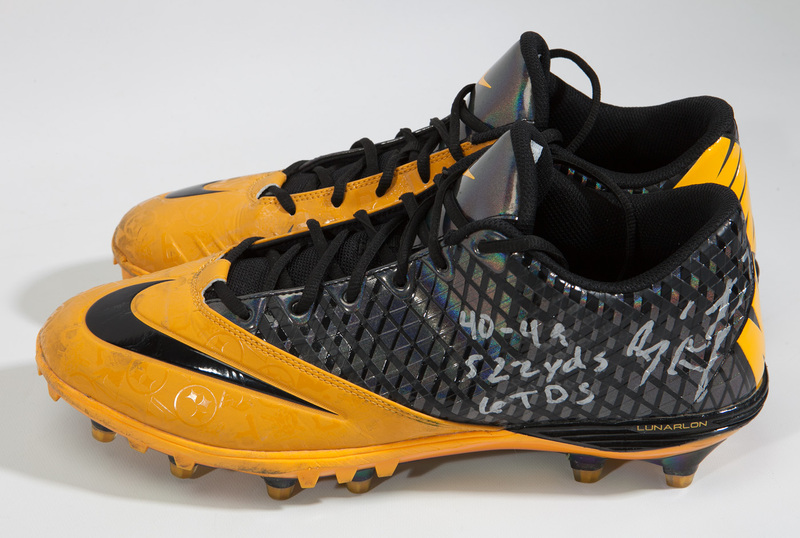 It is super rare when an athlete is willing to part with milestone memorabilia from his career. Even rarer when that athlete is still in his prime. Such is the case with this incredible lot. 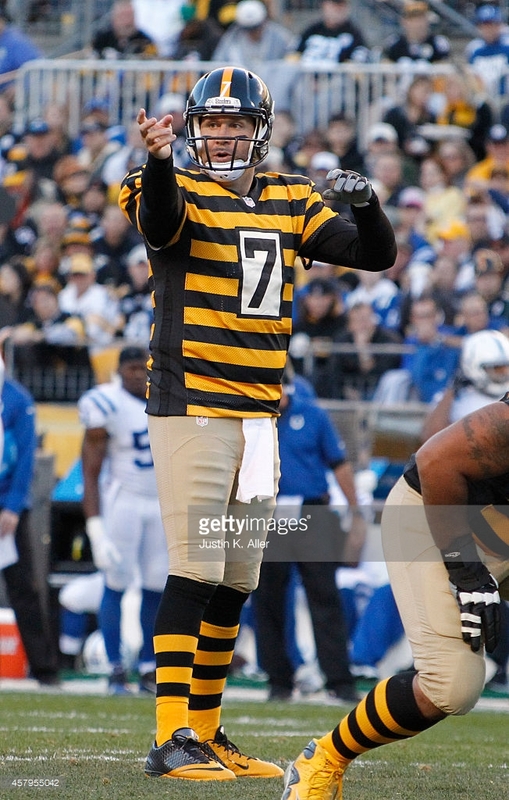 In association with his agency, Rep 1 Sports, Big Ben is offering a 9-piece, head-to-toe uniform ensemble from his monster 522-yard, 6 touchdown game against the visiting Indianapolis Colts on October 26, 2014. 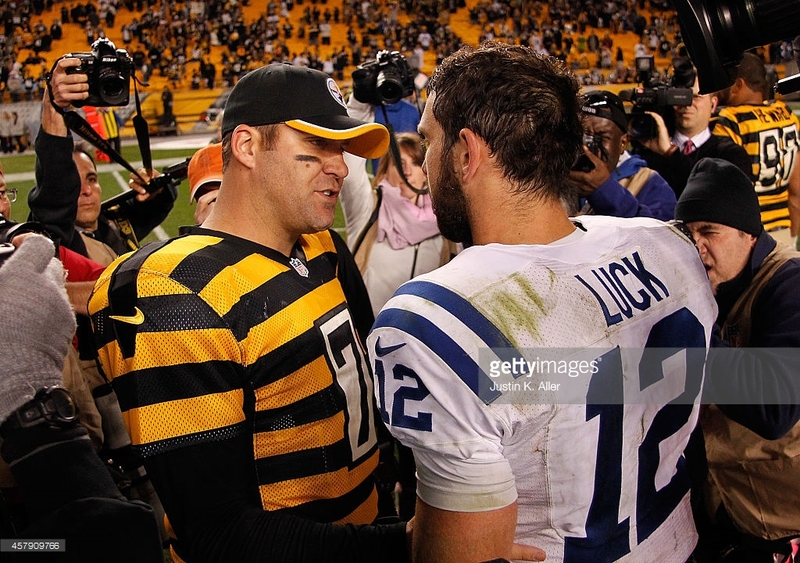 Both marks set Steelers team records in the 51-34 shootout victory over Andrew Luck and the Colts at Heinz Field. In addition, Ben became the first quarterback in NFL history with two 500-yard passing games (the other coming in a 2009 win over the Packers). Everything but Ben’s jersey and helmet are offered from the game. The jersey went straight to Canton, OH for Hall of Fame display. The helmet was used in other games later in the season. 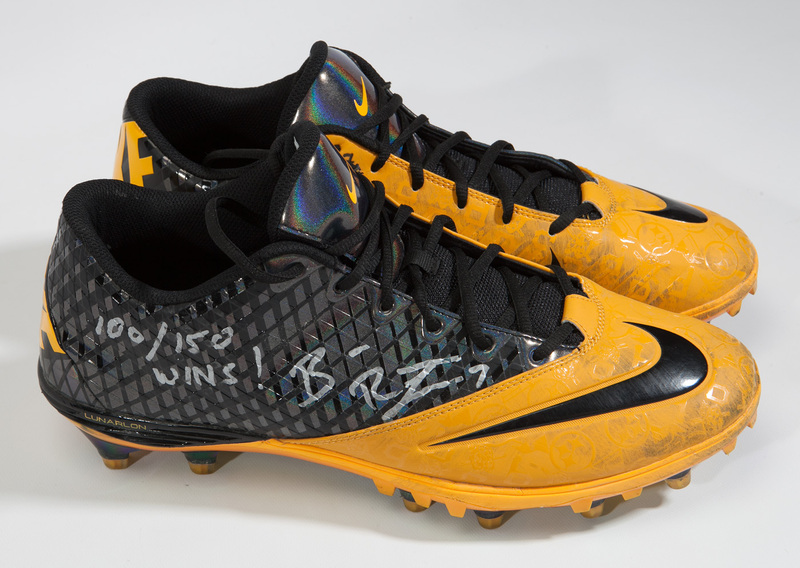 Starting at the bottom, we have Ben’s gold, black and silver Nike “Superbad Pro” cleats. The size 14 shoes exhibit awesome wear with grass and mud stains. There are still little chunks of Heinz Field mud stuck to some cleats. On each shoe, Ben has added his signature in shiny 9/10 silver marker. The left is inscribed with his 10/26/14 game stats of “40-49 522 yds 6 TDs” and the right is inscribed “100/150 WINS!” Ben got win #100 of his career in his 150th career game. The interior tagging reads “SEASON SU14” and “PROMO SAMPLE20140718” confirming that these cleats were player-issued only. Original black laces intact. 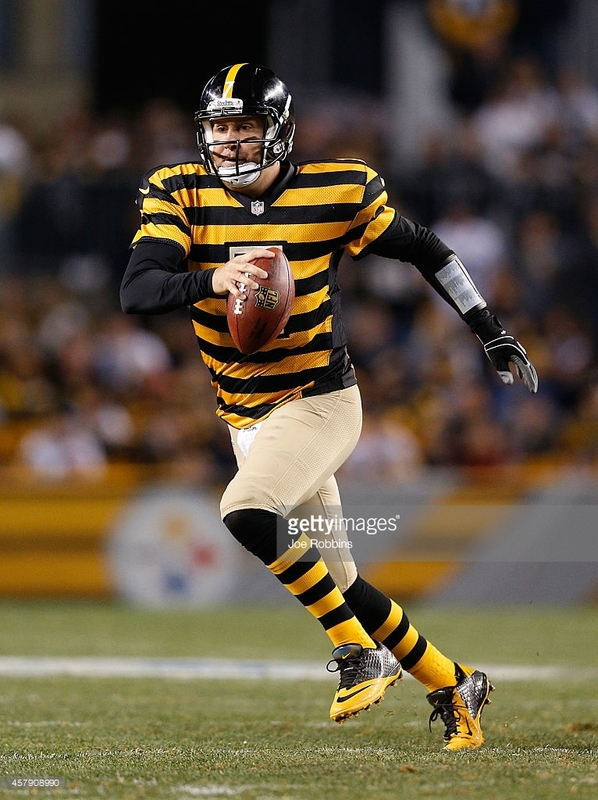 The Steelers wore their 1934 “Bumble Bee” throwback uniforms that game, so Ben sported the featured black and gold Nike socks and pulled them up to his knees for a vintage gridiron look. The size XL-T socks show sweat staining and are both signed in black marker. Next we have Ben’s game-worn khaki-colored Nike pants in size 34. 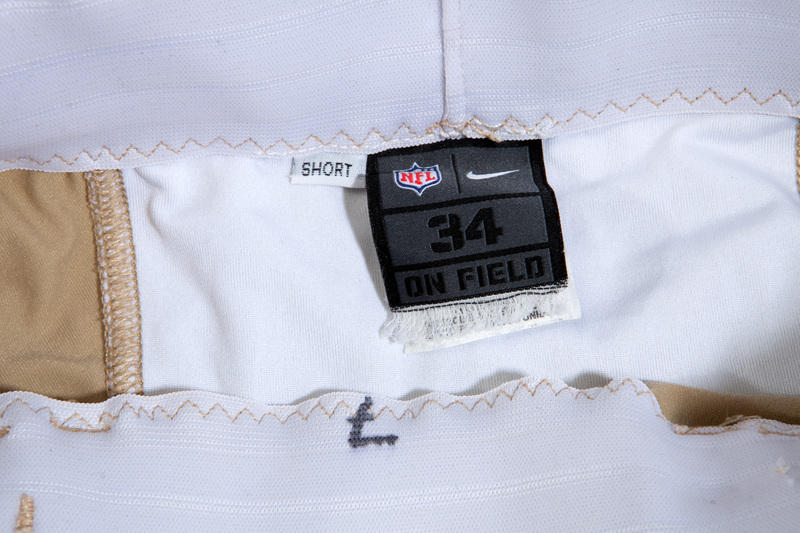 The manufacturer and laundry tagging are found inside the rear waistband with a “short” flag tag as Ben wore shorter pants with his knee socks. His jersey number “7” is marked in black pen inside the front waistband. The size 50 belt is also marked “7” and has “PFJ” penned in black as well. 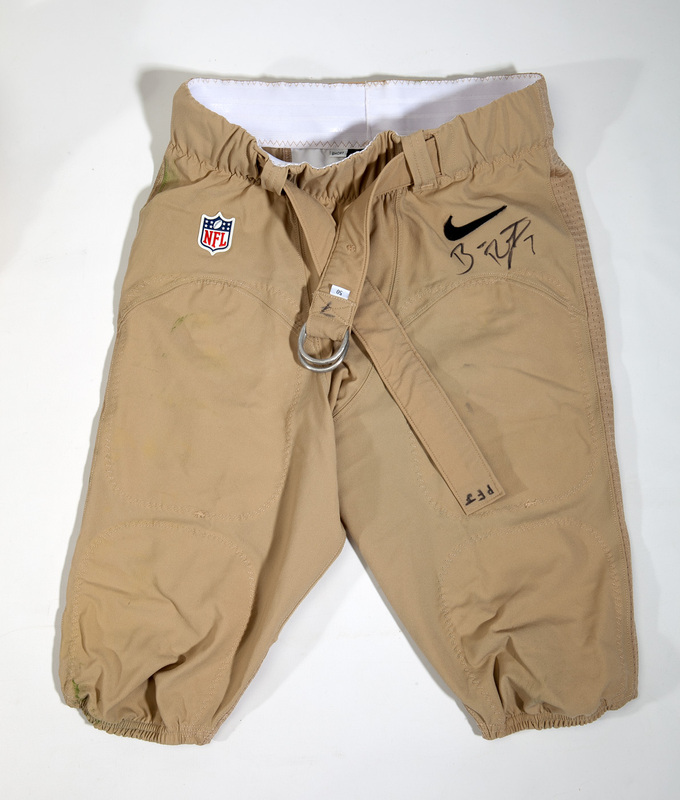 The NFL shield patch appears on the right front side of the pants and Ben has signed in 8/10 black Sharpie on the left front side next to the Swoosh. Plenty of grass stains are visible on the front, especially near the elastic hemmed knees. 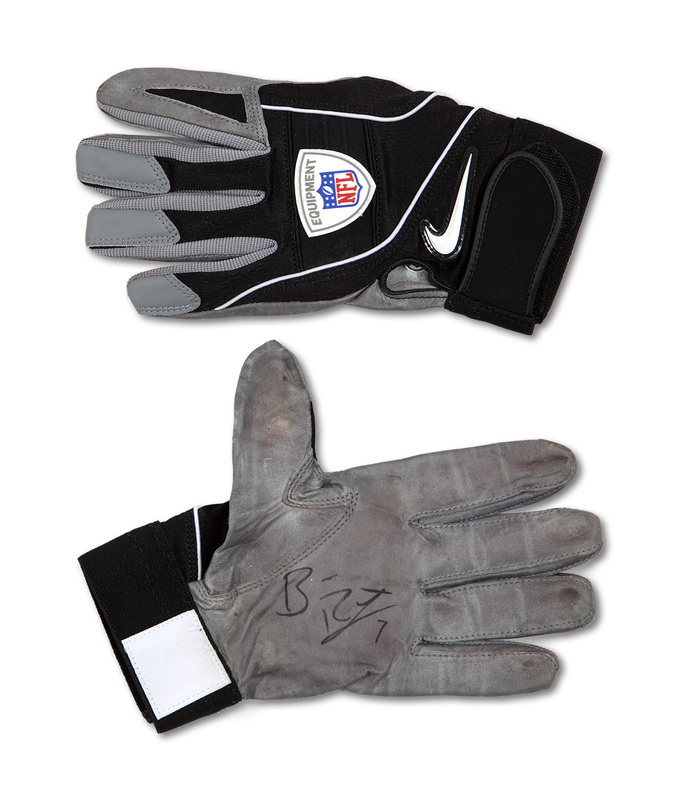 Moving up we have Ben’s game-used white Wilson towel emblazoned with the NFL logo and the black and gray Nike glove he wore on his left, non-throwing hand. Both show soiling and sweat staining and are signed in black. Finally, we have Ben’s game-worn black Steelers New Era sideline cap (size L-XL flex fit) and his game-used black elastic wristband playbook, each signed by in silver. The following week on November 2, 2014 against the Ravens, Big Ben threw 6 touchdown passes again (see Lot 898), adding yet another NFL record to his resume: the first to throw for 12 touchdowns over a two-game span. He threw 6 TD passes without an interception in back-to-back weeks for an unfathomable statline of 65/86, 862 yards, 12 TD, 0 INT. That has to be the greatest statistical two-game stretch ever for a quarterback. What a treat to be able to present this lot to the collecting community. 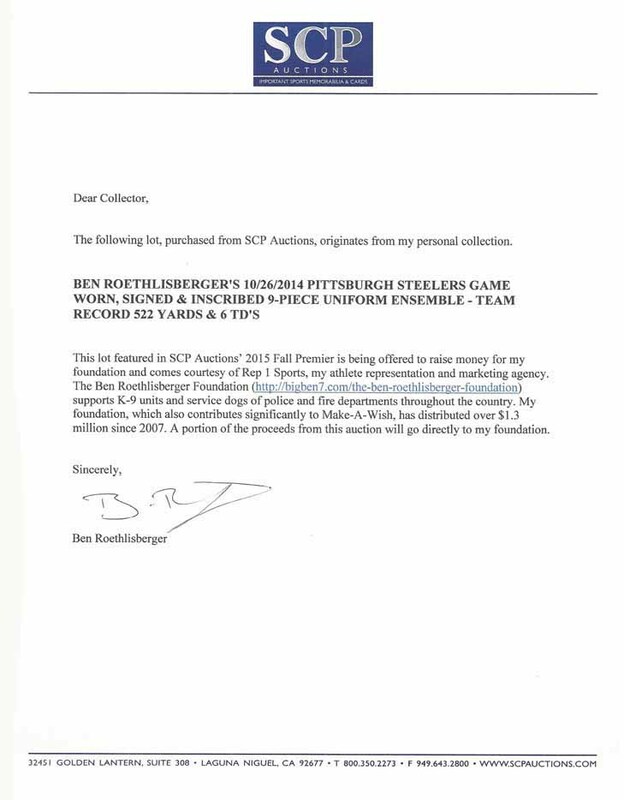 A portion of the proceeds will go directly towards The Ben Roethlisberger Foundation (http://bigben7.com/the-ben-roethlisberger-foundation), which supports K-9 units and service dogs of police and fire departments throughout the U.S.
Includes Letter of Authenticity from Ben Roethlisberger. Pre-certified by PSA/DNA. Auction closed on Sunday, December 6, 2015.